Very fast and easy to crochet, this is a beginner crochet pattern for a four leaf clover that can be made in minutes, using just a small amount of green yarn. Add a pin back, and you can wear the green for St. Patrick’s Day, or substitute crochet cotton and a smaller hook to make a lucky four leaf clover that you can add to a homemade greeting card or enclose in an envelope to send to a friend. 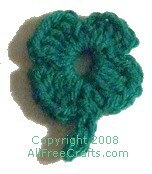 We also have a similar pattern to make a Crocheted Shamrock. Chain Stitch, ch st: Make a loop on hook, pull another loop through it, forming 1 ch st, repeat for length required. Slip Stitch, sl st: Make a ch, skip 1 st, insert hook into ch st, thread over hook, draw through ch st and loop together. Double Crochet, dc: Make a ch, thread over hook, skip 3 sts, insert hook into next st, draw thread through ch, thread over hook, through 2 loops, thread over hook, through 2 loops. In this pattern, all the double crochet stitches are done directly into the base ring. Ch. 6 and join with sl st to make the base ring. *Ch. 3, 3 dc in ring, ch. 2, sl st in ring (first cluster made); repeat from * to make three more clusters. Ch. 6, sl st in second chain from hook, sl st in each chain back to the clover leaf base, sl st to ring, fasten off and weave in the ends.